Dutch-made “Mobile Factories,” the size of two shipping containers, are turning rubble left behind from wars, natural disasters and urban development into earthquake-resistant building materials. The recycling process not only builds homes, but solves a pollution issue. In an effort to rebuild homes and hospitals, a single Mobile Factory processes rubble, which is sorted and separated to allow concrete to pass through a crushing stage. A filtering process removes any hard-to-find metallic objects from the concrete, which is later liquefied. Close up of one Q-Brixx block. Image courtesy The Mobile Factory. 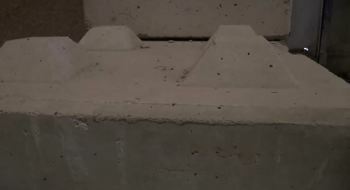 After preparing the mixture, 20x10x10cm (8x4x4in) Q-Brixx blocks take about 12 hours to cast. Blocks are stacked and interlocked without requiring cement or mortar, similar in design to Lego bricks. After preparing the ground work, blocks are stacked by hand. 20 four meter Bamboo poles are inserted into the walls to provide extra stability. More poles and a steel cable anchor the roof, consisting of 100m2 metal panels and a bamboo frame. Three brightly painted concept homes stand in an industrial park in Amsterdam. Image courtesy The Mobile Factory. Victims of the 2010 Haitian earthquake will be the first to benefit from the civil engineering technique. 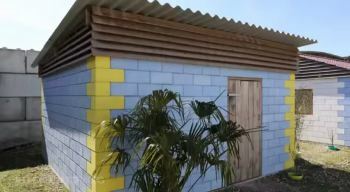 30 families in the outskirts of Port-au-Prince will see the construction of what Gerard Steijn, founder of The Mobile Factory, calls “Petit Paradis”. Steijn, working with Haitian land owner Joel Dresse and civil engineer Hennes de Ridder from the University of Delft, hopes to produce 750 building blocks a day from the area’s debris. To find the funding for each $20,000 house, Steijn launched an Indiegogo crowdfunding campaign to raise $400,000. The money raised will be used to build 20 homes and stress test the structures by next spring. The Mobile Factory raised $2,215 in its first 20 days. De Ridder expects further stress tests he planned for Peru in a few months will show the homes can withstand temblors of at least six on the Richter scale. Red Cross and United Nations officials have expressed interest in the project, said Steijn in an article by Stella Dawson for Reuters. To learn more about The Mobile Factory, visit themobilefactory.org.